As China was piling up huge multitrillion-dollar trade surpluses between 2000 and 2010, certain Chinese companies with access to those reserves went on global shopping sprees. The biggest of the big spenders was HNA Group, a Chinese conglomerate that is believed to be backed by favored members of the Communist Party of China and possibly the Chinese military. HNA acquired well-known brands such as Hilton Hotels and Deutsche Bank as well as trophy properties in major cities around the world. To make these acquisitions, HNA borrowed from a syndicate of banks, including the largest banks in China such as ICBC and the Bank of China. Massive leverage, massive valuations and massive acquisitions were all part of the HNA growth story. Now that engine of growth is spinning in reverse. China has prohibited the use of foreign exchange for acquisitions outside China without special permission. The valuations of some HNA assets have begun to cool off (Deutsche Bank just reported a losing quarter and its stock plunged, wiping out a large part of HNA’s collateral value for its bank loans). And HNA’s mountain of debt is coming due. 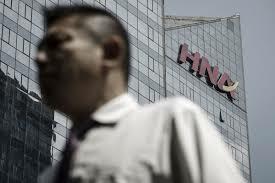 It will be difficult for HNA to avoid either bankruptcy or a major debt restructuring that could set off a broader credit panic in China. Of course, the Chinese government has the funds to bail out HNA, but that would undermine all of the recent efforts of the Chinese government to reform its financial sector. HNA has also been barred from further acquisitions in the U.S. by the U.S. government on national security grounds. HNA is facing lost access to foreign exchange and foreign markets, declining asset values and demanding creditors. Click here to see why the HNA story has the makings of a major credit default at best and a Chinese credit crisis at worst.